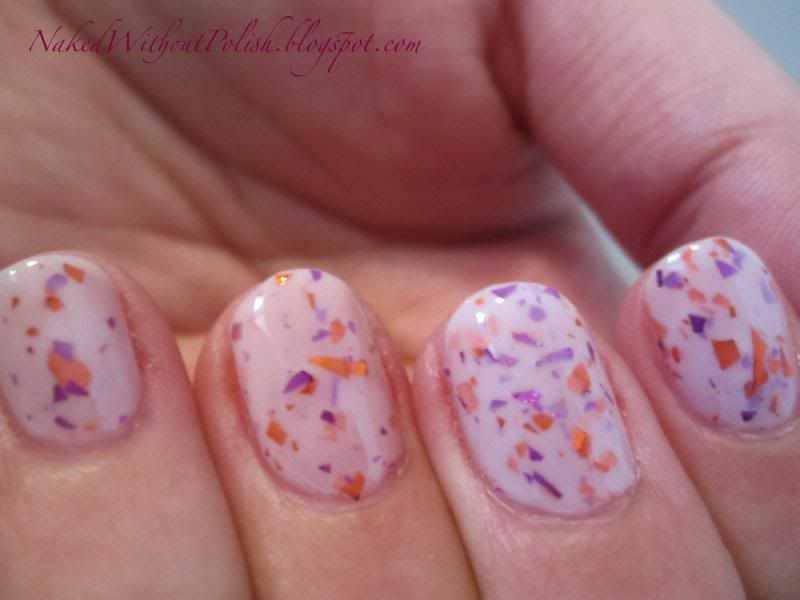 Dunkins is a white crelly (cream + jelly) base with orange and fuchsia shards. It screams the donut and coffee heaven. I'm going to have to keep this on me at all times so I can make sure it's on my nails whenever I go! This is two coats of Dunkins with Cult Nails Get It On and Wicked Fast base and top coats. Such an incredibly smooth application, and, even on the brush of a mini bottle, each time I pulled the brush out of the bottle it was filled glitter. 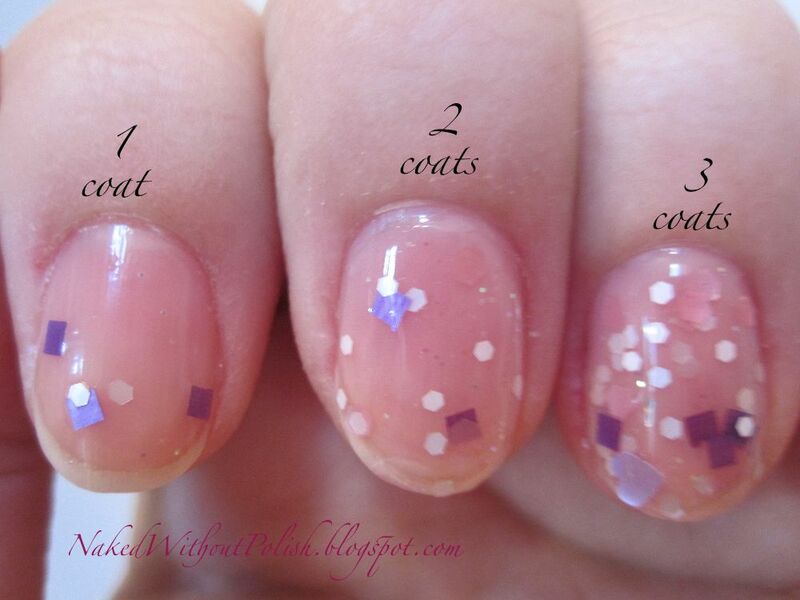 As the first polish, of the three, of A Girl Obsessed that I tried, I was very much impressed! No pulling, easy clean up, no dabbing to place glitter. It was a polish lover's dream! Shard glitter is really growing on me. I think I need more polishes like this in my stash! Gen Y is a clear base with yellow hexes, metallic blue squares, large metallic blue hexes, and pale pink hearts. Well, it turns out the yellow hexes bled and my clear base is now tinted a neon yellow. It screams 90's and I love it! Maybe it's not how it was supposed to be, but who cares because it WORKS!! This is three coats of Gen Y with Cult Nails Get It On and Wicked Fast base and top coats. Not so sure if the base is supposed to be the yellow tint. In the shop it looks like it is supposed to be clear. I have a feeling the yellow glitter bled. To be honest, I am digging the yellow tint. Gen Y had an easy application, but it was just a tad on the thick side. Nothing that would turn me away from the polish though. Will definitely reach for this one again! Left to right: Zoya - Carmen, Barielle - Mint Ice Cream Cone, Cult Nails - Blackout, Zoya - Coraline and NOPI - Ladies in the Limelight. This is two coats of Gen Y over two coats of Zoya - Carmen. Carmen is a true red creme. This was a no brainer pairing. The colors compliment each other perfectly!! You see every speck and yet the red doesn't take away the integrity of Gen Y. This is two coats of Gen Y over two coats of Barielle - Mint Ice Cream Cone. Mint Ice Cream Cone is a soft pastel mint creme. This combo fell flat. 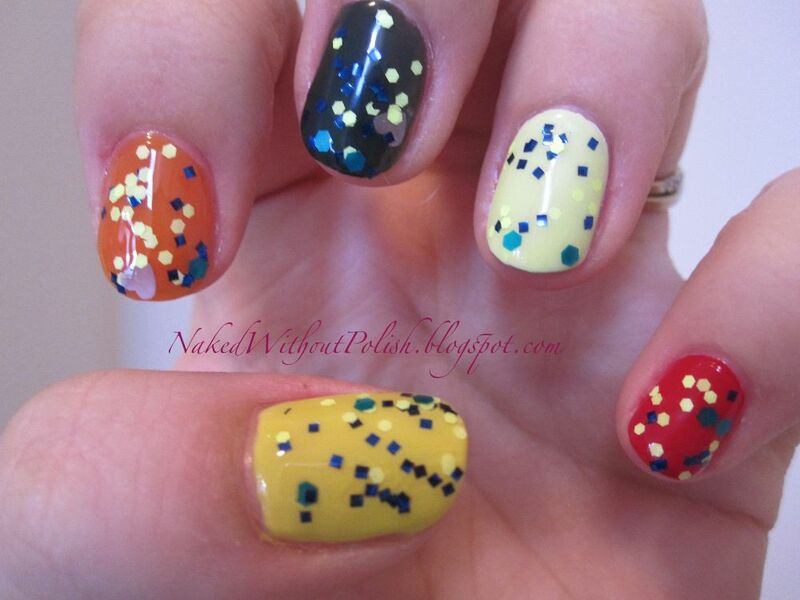 The yellow glitter bled so much they were too pale to really pop on the green. A more vibrant or kelly green would be better paired with this. 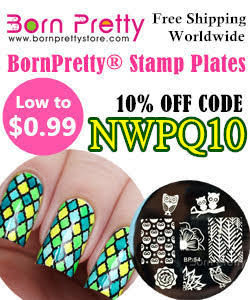 Maybe try Cult Nails - Feelin' Froggy paired with Gen Y if you are looking for a good green. This is two coats of Gen Y over two coats of Cult Nails - Blackout. Black out is a deep slate grey similar to the color you see when you turn off the lights...not quite pitch black but that hazy almost black. The blues didn't pop as much as I wanted, but you can still see them. The yellow pops beautifully off Blackout though. Not my favorite pairing, but better than the green pairing. This is two coats of Gen Y over three coats of Zoya - Coraline. Coraline is a tangerine orange jelly. This was the best pairing of the five. All the colors popped beautifully off the orange. The softness of using a jelly instead of a creme really complimented Gen Y. This is two coats of Gen Y over three coats of NOPI - Ladies in the Limelight. Ladies in the Limelight is a lemon yellow crelly. Not quite cream and not quite jelly. It reminds me of a wonderfully tart lemon curd. The yellow in the glitter was just off enough to show up on Ladies in the Limelight, but not enough to be extremely noticeable. This is another combination I probably won't be doing again. Two out of three ain't bad, but then there was the alternative to try instead of Mint Ice Cream Cone. So I think this was a success! 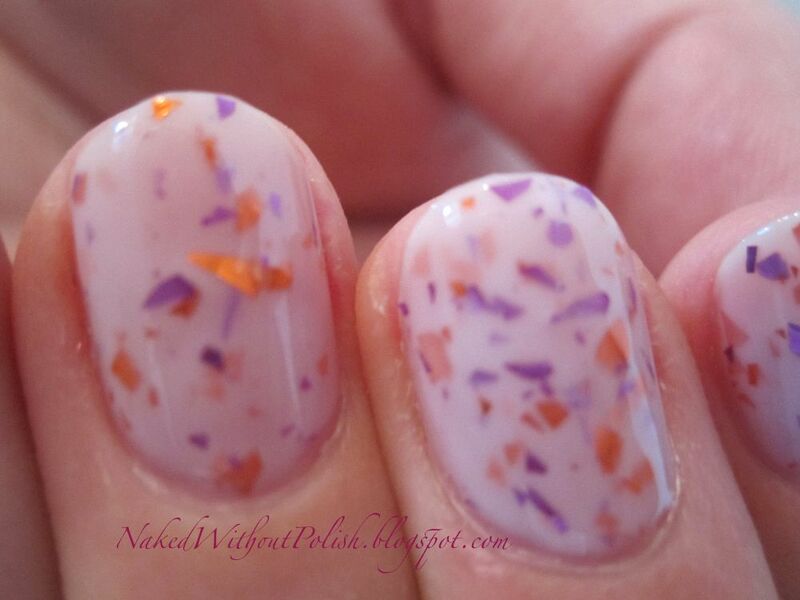 What the Fluff is a clear base scattered with pastel glitters of different shapes and sizes. What the Fluff makes you feel warm and fuzzy inside just looking at the bottle. What you can't see here, is that it is actually a pale pink tinted base and the glitters in this one bled as well. But once again, it didn't bother me. It really added to the polish. The only problem with the bleeding glitters, is that their colors aren't as vibrant as they should be. And even though the polishes still look great, because of the bleeding you know it should have looked more vibrant somehow. This is three coats of What the Fluff with Cult Nails Get It On and Wicked Fast base and top coats. 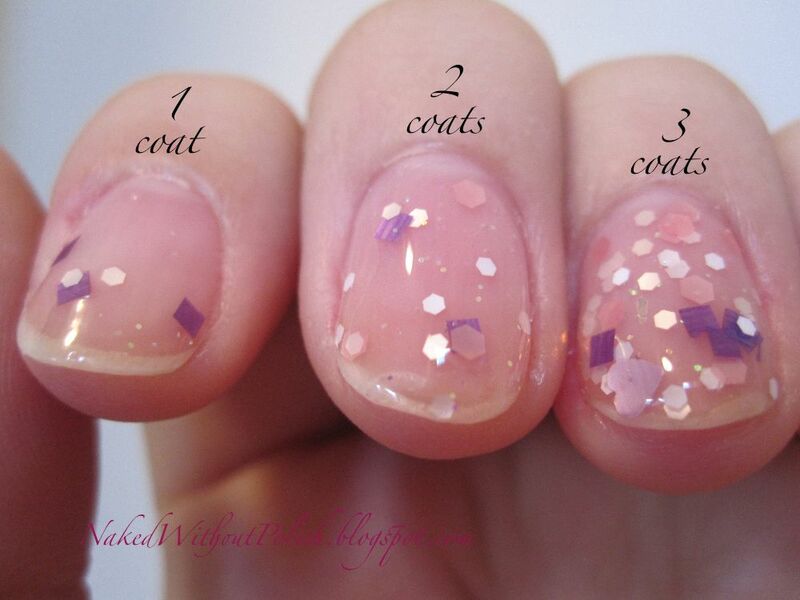 I had to use pretty thick coats, the glitter in this one wasn't as cooperative as the ones in Dunkin and Gen Y. For some reason, What the Fluff reminds me of the unicorn in Despicable Me. 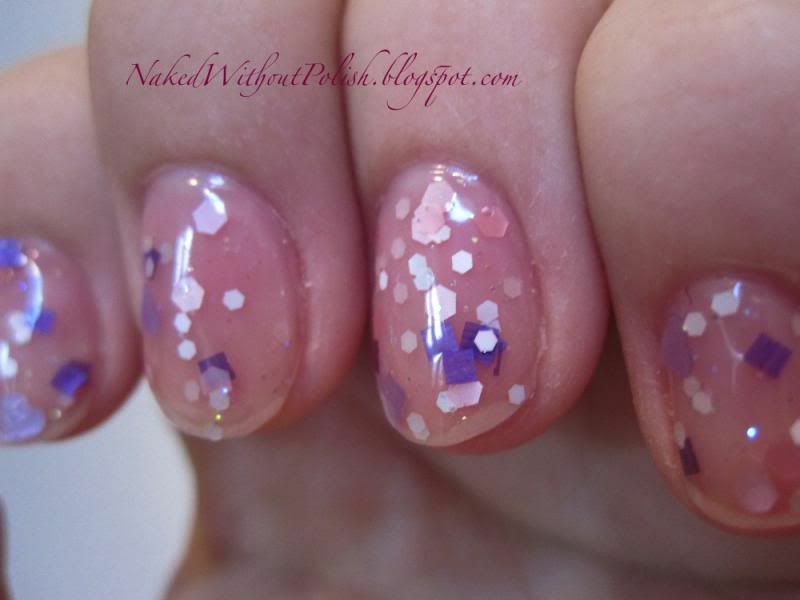 It's soft, feminine and sparkly and is just one of those polishes that makes you happy. 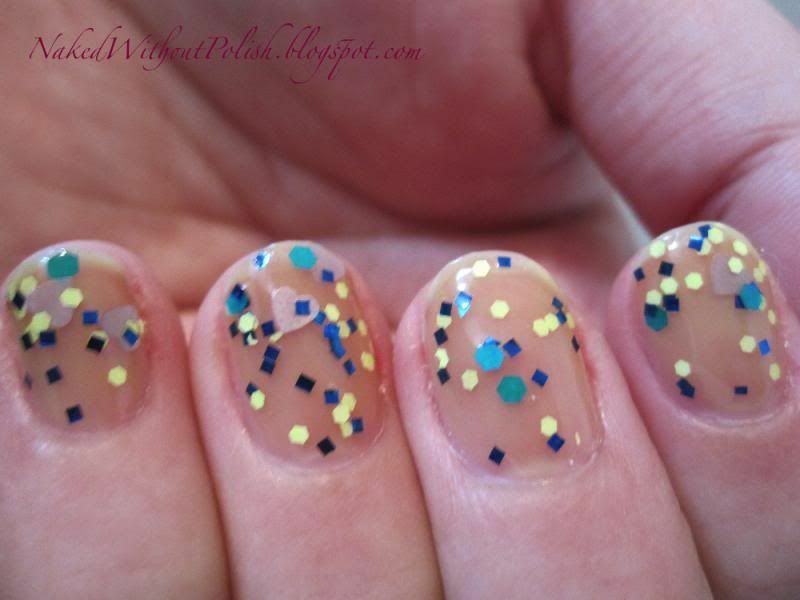 Love the little specks of micro glitter. It's like your favorite hoodie/sweater fresh out of the dryer. So comforting and familiar. Left to right: Wet n Wild - Wild Shine - Tickled Pink, Cult Nails - Manipulative, Zoya - Blu, Essie - Lights and Pomegranate Nail Lacquer - Prince Charmer. 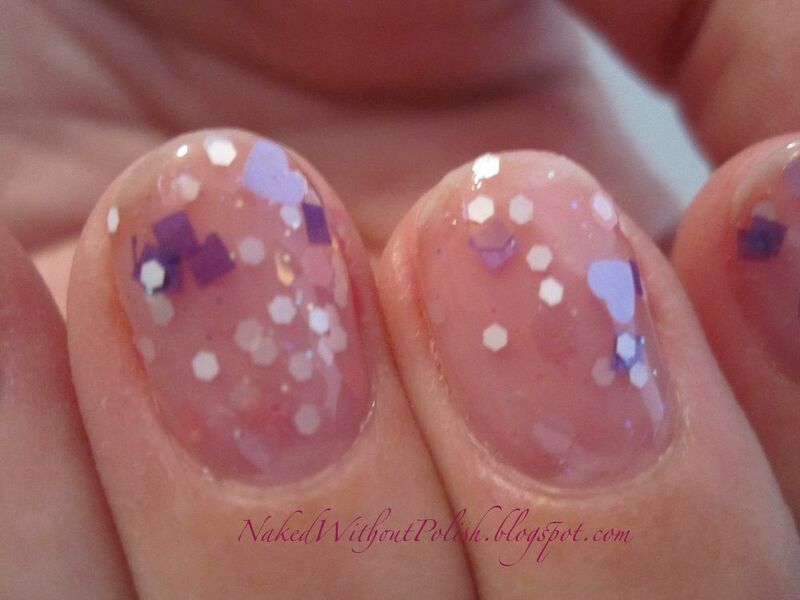 This is two coats of What the Fluff over two coats of Wet n Wild - Wild Shine - Tickled Pink. 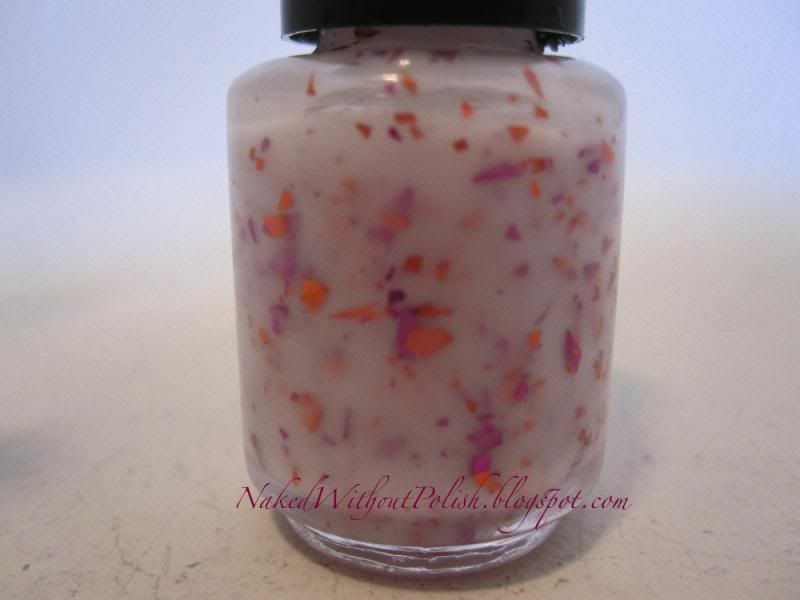 Tickled Pink is a baby pink creme. If I would have been able to get more glitter on my nail, I think I would have liked this better. A couple specks after doing 2 coats doesn't cut it. But the colors do go well together. That's a given. 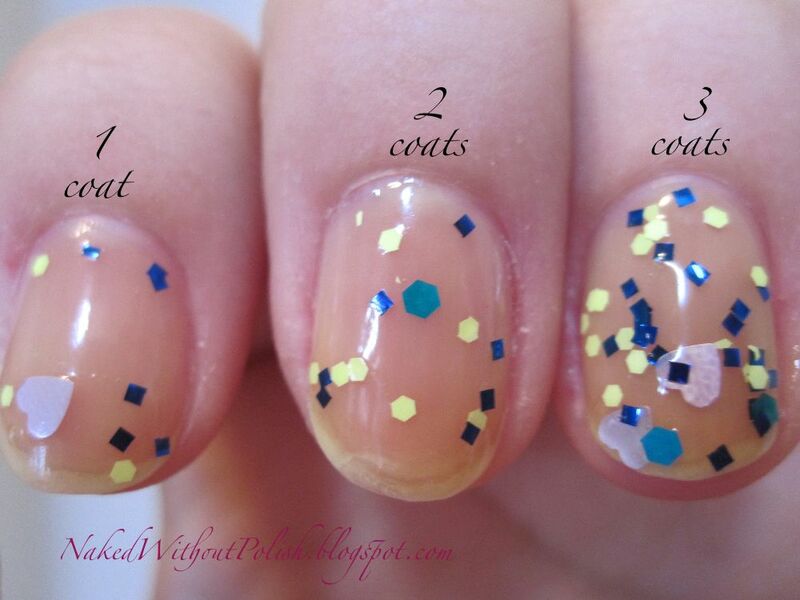 This is two coats of What the Fluff over two coats of Cult Nails - Manipulative. Manipulative is a soft dusty blue, that isn't quite a pastel, that is speckled with a silver shimmer. This combination was one of my favorites. The blue was that perfect shade where all the colors are able to be seen. The dusty base and the iridescent pastel glitter won me over in this pairing. This is two coats of What the Fluff over two coats of Zoya - Blu. Blu is a lovely baby blue creme. Even though all the glitter can't be seen at all times, you still see the iridescent shimmer of the glitter and the way it pops off the powder blue is lovely. This pairing was really soft and feminine. Would be beautiful with a sundress. This is two coats of What the Fluff over two coats of Essie - Lights. 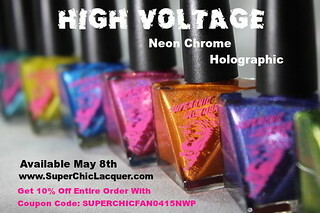 Lights is a vibrant hot pink creme with blue undertones. Lights was able to transform What the Fluff. Instead of being flirty and feminine, it became in your face and playful, and you still get to see all the glitter. Not a piece is taken over by the brightness of Lights. This is two coats of What the Fluff over two coats of Pomegranate Nail Lacquer - Prince Charmer. Prince Charmer is a beautiful lavender creme in it's absolute perfection. My favorite pairing of the five. These two complimented each other perfectly! I don't think it gets any better than this! So despite the couple flaws in 2 of the polishes (the bleeding glitter in both, and What the Fluff being a little thick) I really enjoyed these polishes. Especially from such a new indie. With a little tweaking these would be flawless. So, definitely keep your eyes on A Girl Obsessed. If she keeps this up, who knows where she will be in a couple months! 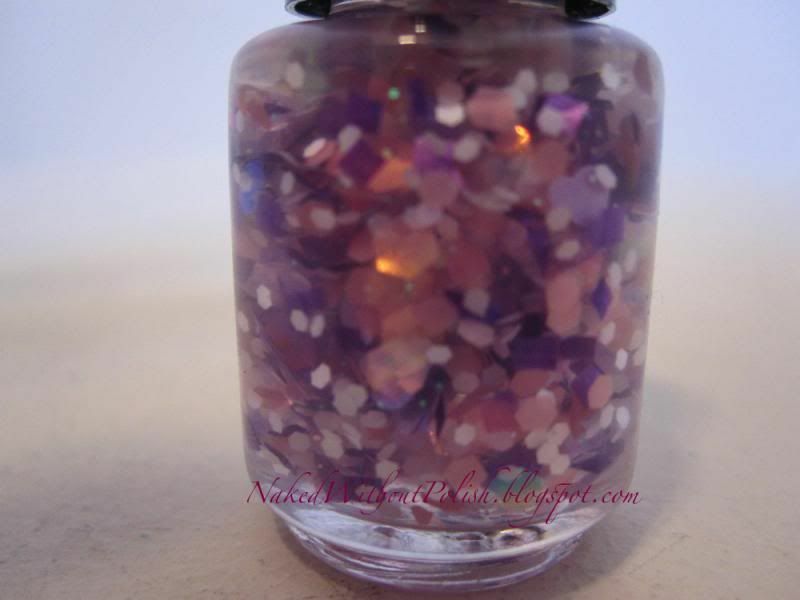 You can snag these or several other beauties for $4.50 for a mini bottle or $8-$8.50 for a full sized bottle. 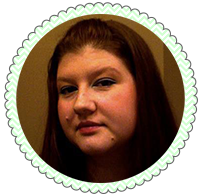 She's got some great originals and some dupes of colors that might be otherwise hard to find.